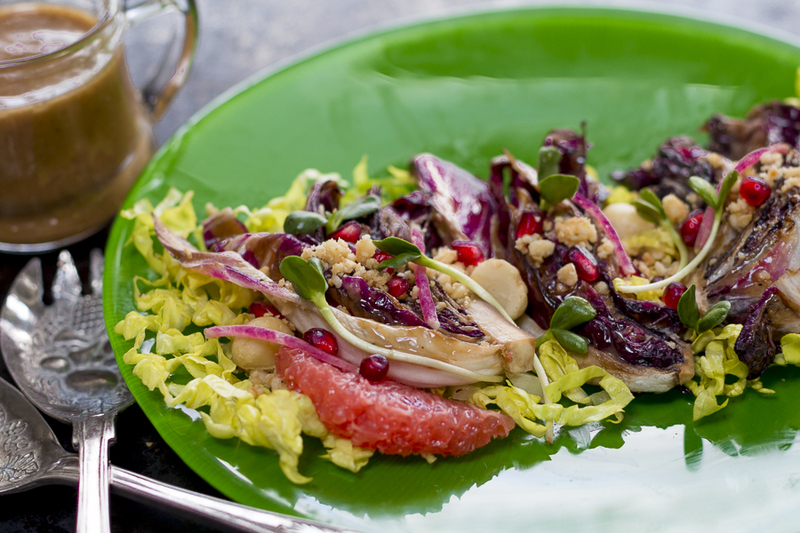 My favorite winter ingredients together in a salad worthy of entertaining. Bitter and sweet flavors with crunch and a decadent dressing. Make citrus “suprêmes” – section the grapefruit : With a small serrated knife remove the peel from the grapefruit to reveal the fruit. Cut away the white pith. Remove the first segment, cut from the outside to the center just inside the membrane on either side of a section. Place the citrus suprêmes (segments) on a plate. Grill the radicchio: Cut the radicchio in half. Cut each half into three wedges, add them to a plate to make 6 wedges. Brush a little neutral oil* on each side of the wedges. Pat 1/4 teaspoon of sugar on each cut side, pat in a bit. Heat a cast iron skilled until hot. Add the wedges and cook on the first side over high heat for 1 minute – or until dark and caramelized. Turn over with togs and repeat on the second side. Set on a plate to cool. Scatter the top with pomegranate seeds, sprouts, and macadamia nuts. 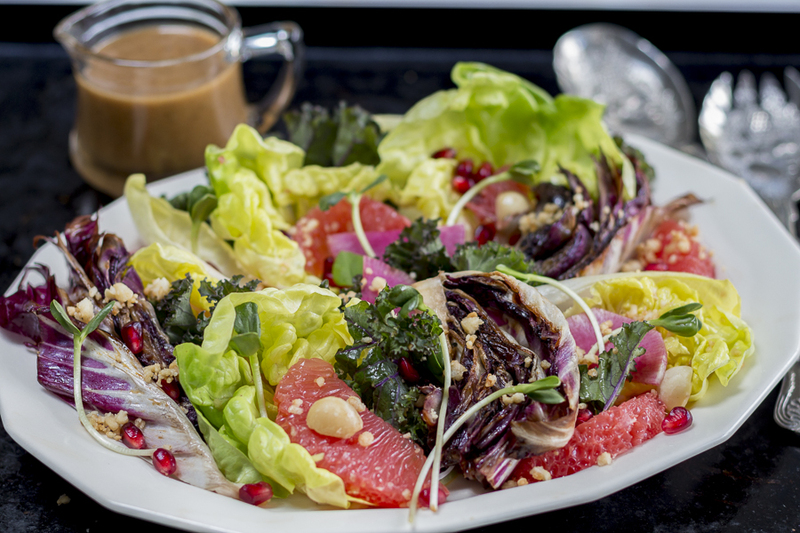 Drizzle with Pomegranate-Macadamia Vinaigrette on top and serve. * with concerns about gmo’s and processing of oils, use a vegetable oil which has not been chemically treated, this is called “expeller pressed”.